Last weekend, I was planning to attend a Greek Easter party (my first) in Queens, NY, when my friend asked if I wanted to grab some dinner before the party. Who am I to say no to dinner? 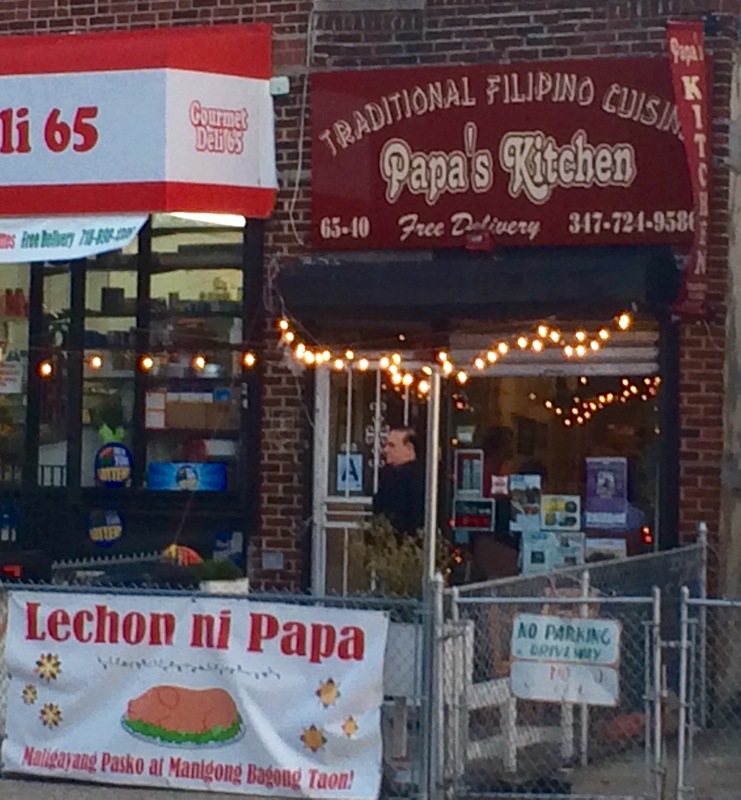 So we made plans to meet up with a couple of others on Saturday night Filipino food at Papa’s kitchen in the Woodside neighborhood of Queens. As I walked the few blocks from the 7 train to where Google was telling me the restaurant was located, I noticed it seemed a bit residential. Were we going to one of these underground restaurants starting to pop up around NYC the last few years? Or maybe a dinner party through something like Feastly? Alas, while eating in Papa’s Kitchen at times felt like you were in someone’s home, it is definitely a bonafide foodery, but with homely charms. hole in the wall–in best way possible. Beth was super friendly, and even spoke to my friend in Tagalog. As a waitress she was very attentive, which admittedly was probably easy since the space was small–my estimate was 2-3 small as well as 2 larger tables. We were a party of four, so were lucky to have a great window booth in the front. This place is all about no frills, simply authentic Filipino cuisine. The tables were simply decorated with the food served on styrofoam plates covered with banana leaves with plastic cutlery. 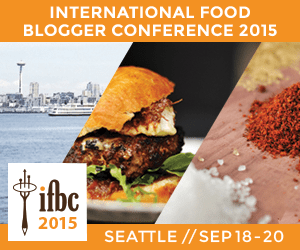 The food is not out of the box or super modern, but that’s what makes it great. Personally, I feel that places like Papa’s are missing from the NYC food scene today. Here it’s all about the pure home dishes, and all of the food tasted fresh and home cooked. Food > frills any day! 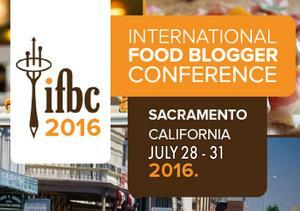 Oh, not to be forgotten, this place is BYOB, with a decent liquor store down the block. Plus, they have karaoke (for free)! Although it was king of a hard sell–a tad aggressive lol–it made the atmosphere kind of awesome. Most important though is the food! Since I wasn’t as familiar with Filipino cuisine as my friend, I let him take the lead and just focus on eating, and singing of course. We started with the Shanghai ($7.95) or Lumpia Shanghai, which is perhaps one of the most well-known Filipino foods. 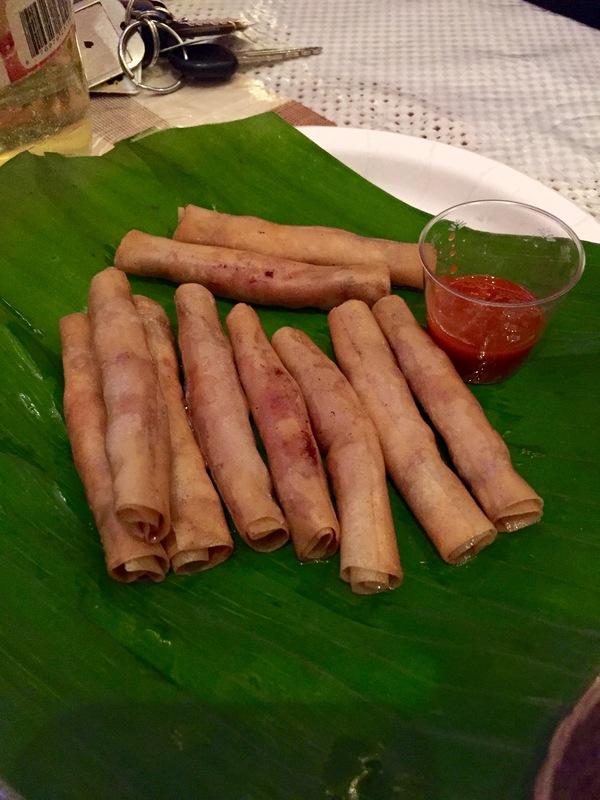 In fact, there are restaurants like Lumpia Shack in Brooklyn and the West Village that specialize in these Filipino spring rolls. Naturally, these seemed like a good place to start our meal. The Lumpia were a little greasy, but made them more authentic. They were extra crispy with a nice crunch, and reminded me of a Middle Eastern cigar dish. They came with a pork filling that was deliciously moist, and a spicy dipping sauce on the side that reminded me of sriracha. Ten of them came in the order, so we were all able to have a couple. Next up was the Pancit Palabok/Luglug ($8.95), a dish of thick udon-esque noodles that were cooked in a shrimp sauce with cabbage. The noodles themselves were nice and aromatic with a great chew. The boiled egg and pork rid garnishes provides a nice textural contrast. 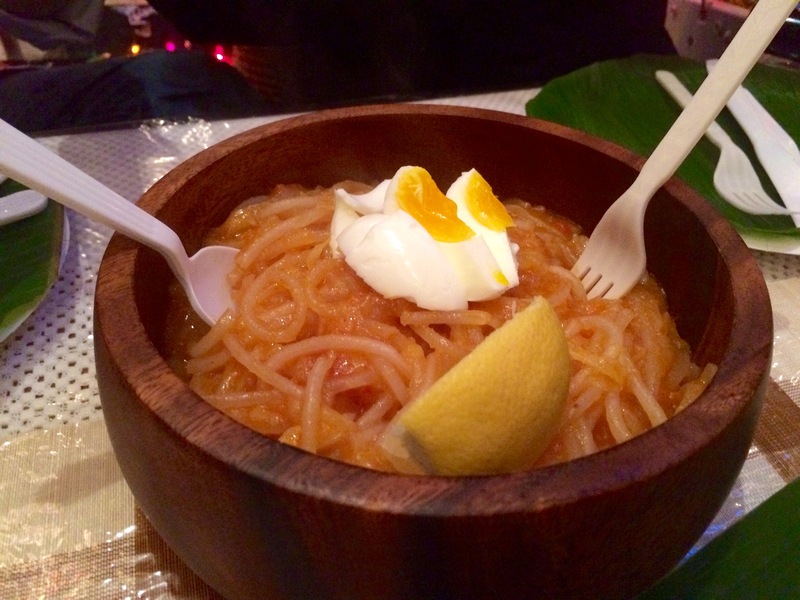 The lemon, when squeezed over the noodles, provided some much-needed acid to balance out the heaviness of the noodles. 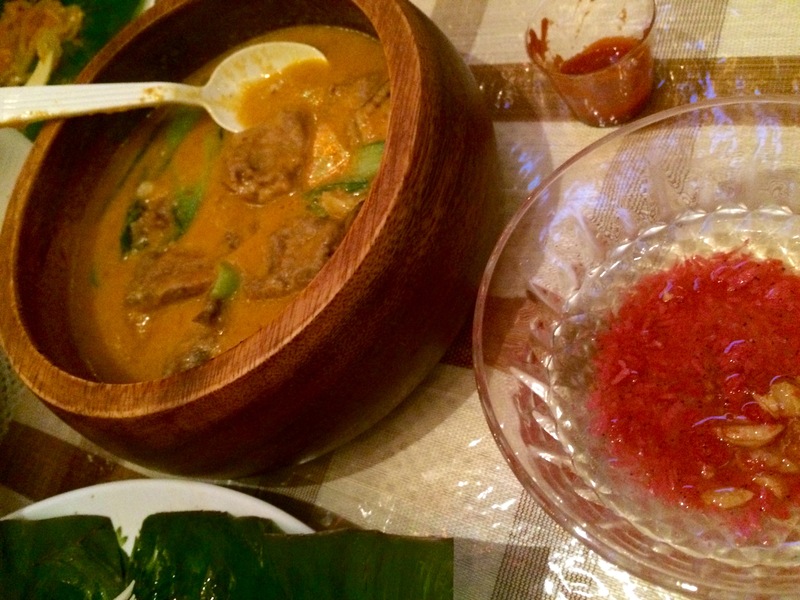 The Kare Kare ($12.99) entrée came out about the same time as the noodles, along with a large communal bowl of rice. The dish consisted of beef stewed with eggplant, bochnoy (a version of boo choy?) and string beans in peanut sauce. The beef was super tender and the string beans retained a nice crunch. The rice was great to soak up the sauce. A salted shrimp liquid garnish elevates the curry like dish from almost bland compared to the other dishes. Using some of the chili sauce was great with the Kare Kare as well. The most anticipated dish, for me at least, the Crispy Pata ($14.99) was up next. To summarize in one word: Yum! Pata refers to the pork, in this case a pig’s trotter or foot, although it doesn’t look like a foot at all when it comes to the table. 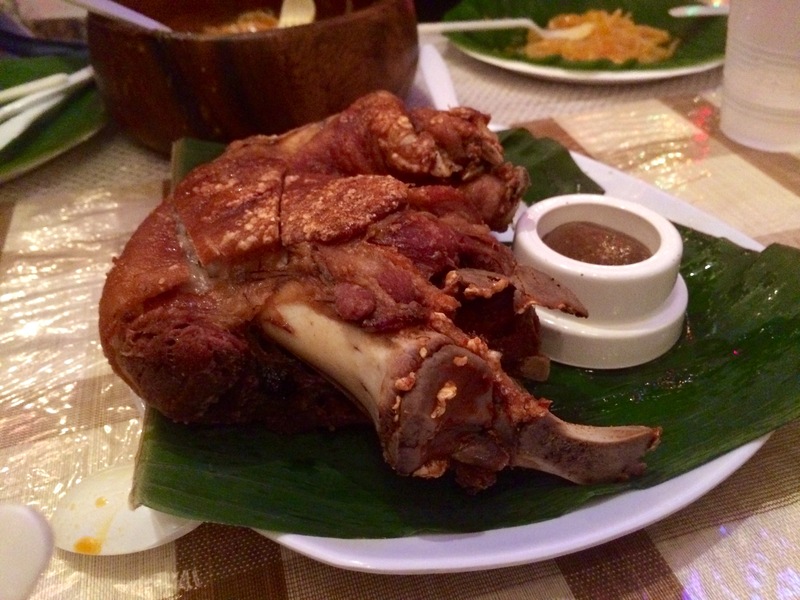 The Pata lived up to its crispy moniker with the super crispy skin–almost like cracklings. The meat underneath the skin was fatty and delicious, and so moist that we used our hands to tear it off the bone. There was a nice spicy sauce on the side to slather on the meat, and a separate dipping sauce for the skin of chili vinegar. The chili vinegar was tangy with a nice bolt heat, but not too strong. It was a nice break from the heavy meat and helped cut through the fat of the pork. While the Crispy Pata might have been the showstopper, the dark horse might have been the vegetable dish of the night, Sitaw n Kalabasa ($10.99). The menu makes a point to note that this dish was in the vegetable, but not vegetarian category. Maybe that’s why the veggies were so hearty. 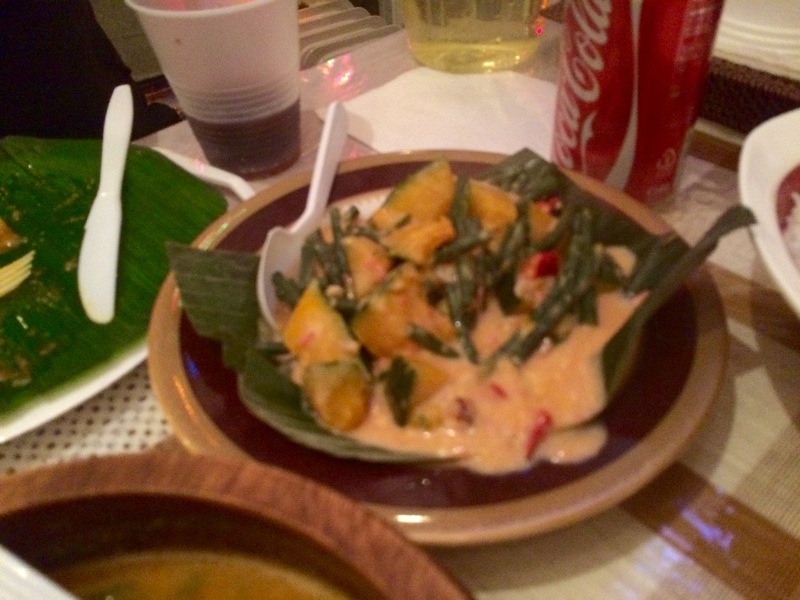 It sounds simple enough, pumpkin and Asian string beans in coconut milk, but the combo was magical. The chunks of pumpkin were plump and tender, but not overcooked. They had an almost potato like meatiness, without the heft that often makes potatoes turn mealy in curry dishes. The pumpkin skin was edible as well. The coconut milk sauce was super creamy and perfectly blanketed the vegetables. While we were waiting for our final dish, my friends decided to order a bonus dish, as if we needed anymore, but this allowed me to sample some more Filipino cuisine, so yay! 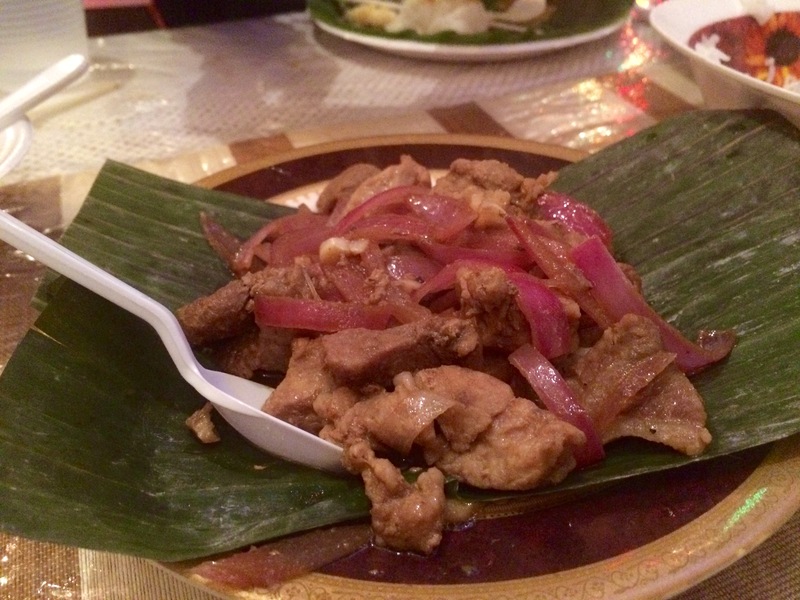 Our order of Pork Adobo ($10.99) was interesting. The pork was braised, so it was slightly meow toothsome than the Pata, but not in a bad way. If that meat was pull apart tender, then this one was almost like a grilled texture. The pork was tossed with red onions that had a salty bite to them. The onions were cooked through, but with a crunch–an almost stir fry texture. The pork was dressed with a tangy, greasy sauce with hints of acid throughout, probably from the soy sauce and vinegar used in the braise. Overall, the dish was pretty addictive; it has a building flavor, and the combination of salty and sour made me keep eating it. 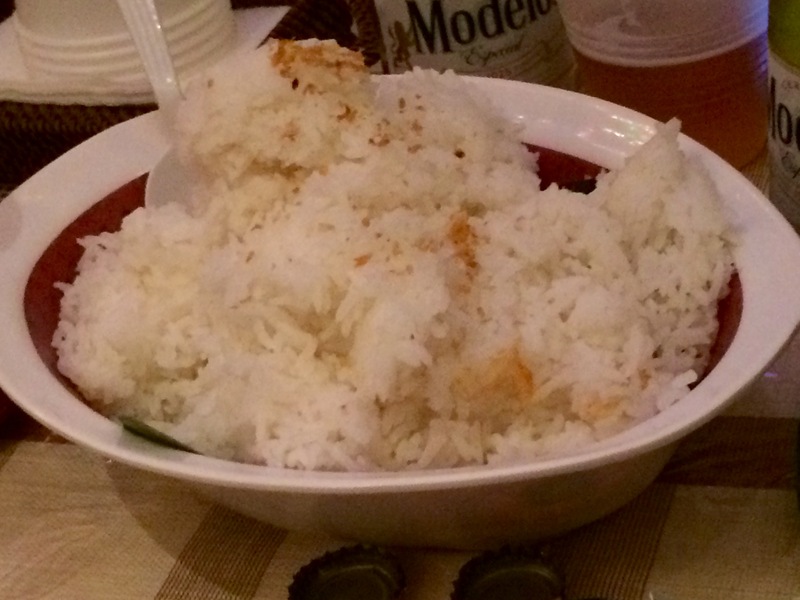 I especially loved having some do the rice that soaked up the adobo sauce. Up last was the Chicken Tinola ($11.99), which was listed as chicken cooked in a ginger broth and is exactly what you get. I somehow felt that this dish should have come out at the beginning of the meal as a starter. Beth brought the clear chicken broth to the table (in a bowl that I actually have at home), and served it to us in bowls at the table. 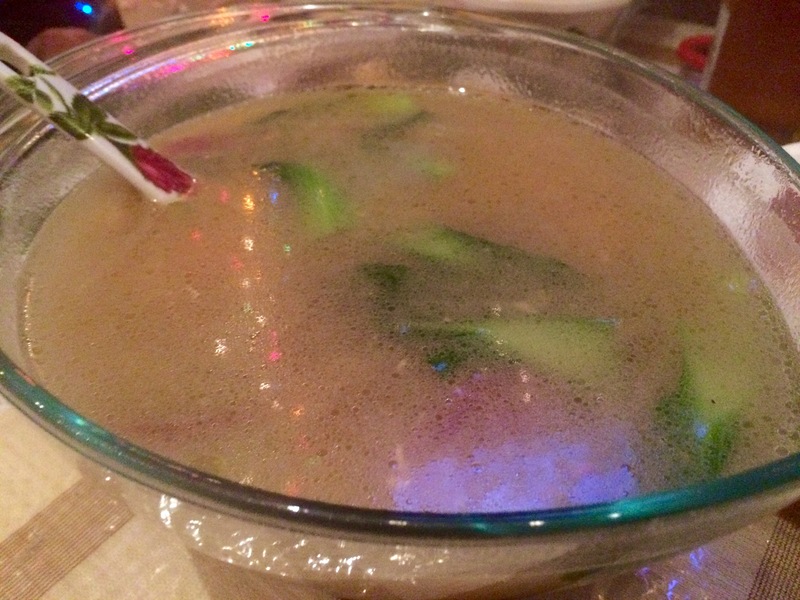 The broth was deeply aromatic and slightly funky from the ginger. The soup had sliced red onions floating throughout, as well as knobs of fresh ginger, bok choy, and pieces of chicken on the bone. The chicken had been cooked in the broth. The chicken meat ended up being nice and tender with a subtle ginger flavor. The real star of this dish was the broth though. Even though it was the end of our meal, I ended up drinking multiple small bowls of the broth. There was a lot leftover, so I wish that I had been heading home afterwards in order to take leftovers for the rest of the weekend. Since the place was BYOB, one of our group went to a store down the block and got a six-pack of Modelo beer, which is from Mexico. The beer was light and refreshing, and just a lIttle bit sweet. Plus, it came in a cool bottle. Overall, the food was delicious and super tasty. This is definitely a place to come back to soon, and I definitely feel like I’ve gotten a taste of the Philippines.